Written by: Stacy McCullough Are you looking for a watch to simply tell the time or do you want a watch that can hit the water and swim? This watch does exist and is made by Invicta. 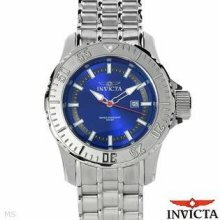 Not only is it high functioning, but it is a good looker, too: Invicta Men’s Pro Diver 502. The 502 is a fantastic watch for those people who love to be around water or just want an accessory that screams, ‘look at me!’ It is a full fifty millimeters in diameter, which means this watch is going to look large on any frame. In fact if you have a small frame, you may want to consider a midsize men’s watch because this watch might eat your wrist for dinner. The case is also a full eighteen millimeters thick. Because the case is a beast and made out of stainless steel – it also weighs a lot. Plan on your hand getting a good workout each time you lift your arm to check out the watch. The band is also stainless steel so that will add to the heaviness. It has a fold over clasp with safety to ensure it stays on you in water and is twenty-six millimeters thick. The dial, however, is a beautiful blue with silver markers and hands. In case you need to count by seconds, Invicta added a second hand in red as well. For those of you who dive, you’ll love that this watch is water-resistant up to 330 feet! Because most people will never go much deeper in water than that, you can be sure you will still have a working watch when the dive is done. And the watch is luminous you even in the darkest of waters, you should be able to keep track of time. Made with Quartz-movement, the watch will be extremely accurate making sure you are always on time to the second. Cartier also placed a stainless steel bezel on the watch that is unidirectional. The one flaw here however, is that it is extremely bulky and can be uncomfortable. The Invicta 502 retails for only $795, which is a steal if you are looking for a great diving watch or work around water a lot. This watch will keep you on time and stay working no matter the water levels. But if you aren’t a diver and are just looking for an awesome looking watch you may be interested to check out the 1009, 885 or 0070. Remember the Invicta Men’s Pro Diver 502 Watch is made to fit large wrists so if you are ready to take on a big watch, try it out.